It doesn't matter how good the sewing is if the material fails after a year, because you can't make quality products without quality materials. Here at SLO Sail and Canvas there are two types of threads that we typically use on our trampolines and boat covers: V-138 UV stabilized polyester thread and Tenara Gore Tex 100% PTFE fiber (commonly known as Teflon). Thread is so important because it is nearly always the first thing to come apart in a boat cover or trampoline. This thread is the standard in sailmaking. It has extremely high tensile strength and abrasion resistance, and maintains very good mildew, saltwater, and UV resistance. This thread is larger than any household thread you’ll ever see, and it’ll take any beating that you’ll give it. The only drawback on this thread is its longevity due to prolonged sun exposure. High sun exposure, especially for those near to the tropics (Florida, Australia, etc..), can cause this thread to lose all of its strength after 3-5 years and cause you to have to get your trampoline restitched (usually in excess of $50). Nearly everyone will benefit from having Teflon thread used to hold together their products, but for those in high sun exposure areas it’s vital. Teflon is completely resistant to UV sunlight, rot, mildew, and color fading. It is also unaffected by cleaning chemicals (even bleach! ), saltwater, and even acid rain. With this thread, a trampoline will virtually last forever and a boat cover will last as long as the fabric. 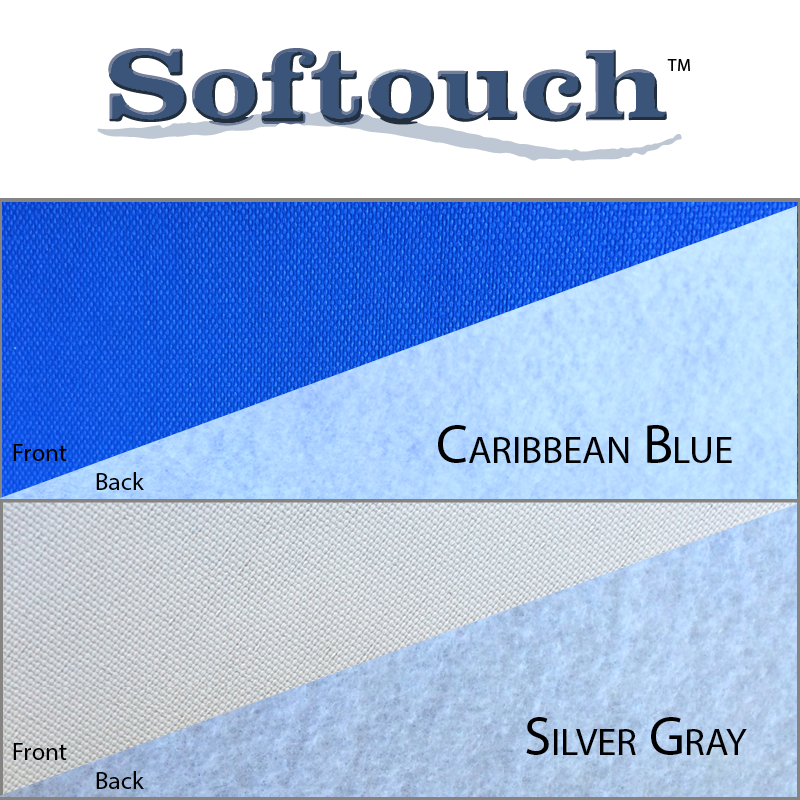 Our boat covers made from Sunbrella and Top Gun come standard with the Tenara thread, and our polyester covers come with the V-138 polyester thread. Our trampolines come standard with the V-138 polyester thread, with the option to upgrade to Tenara thread. 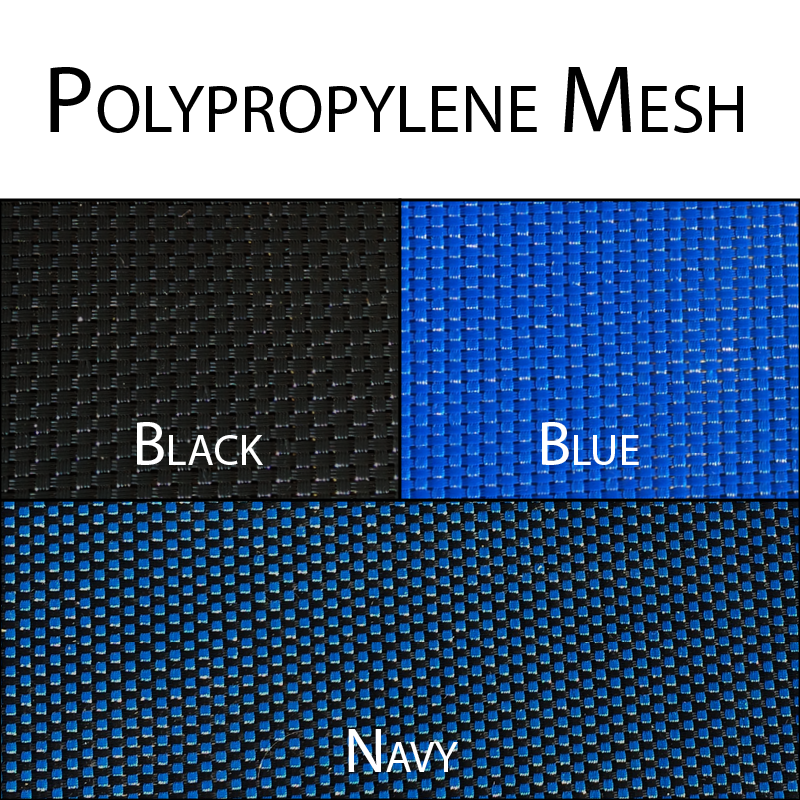 The mesh that we use is 8 ounce polypropylene mesh made in the USA from Tencate or Ariel fabrics, and we chose this mesh because of it’s strength and high quality craftsmanship. It has a tensile strength of 480 pounds per inch of width, so a three inch wide strip of this fabric will hold 1560 pounds. 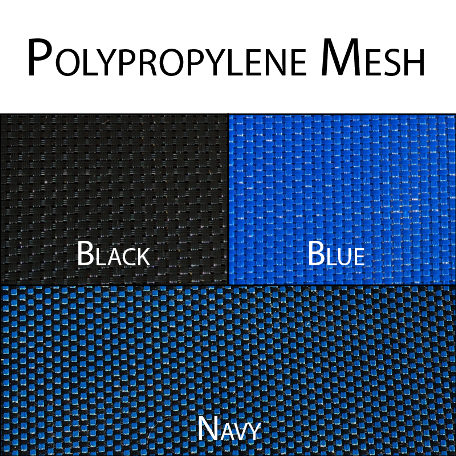 This mesh is very strong and light, and we know from experience that it has the durability to last a very long time. In the grommet areas we use 3″ wide heavyweight polypropylene webbing, which heavily reinforces those areas with the grommets, and it gives the grommets something really substantial to bite into. The mesh is very strong, but adding this webbing helps to better distribute the load into the mesh. A lot of manufacturers only use 2″ wide webbing, but we have found that 3″ wide webbing makes a noticeable difference in distributing the load taken from the grommet areas. The last key aspect to this webbing is that it is UV stabilized, so sun exposure will not damage the webbing itself. The grommets that we use are #4 Stimpson spur grommets made in the USA. Spur grommets have teeth that bite into the fabric, which drastically increases the holding power. These grommets are made in USA of American brass – this is pretty important in the long term as some foreign made ‘brass’ grommets will use inferior materials that will corrode more quickly. Sunbrella is breathable! 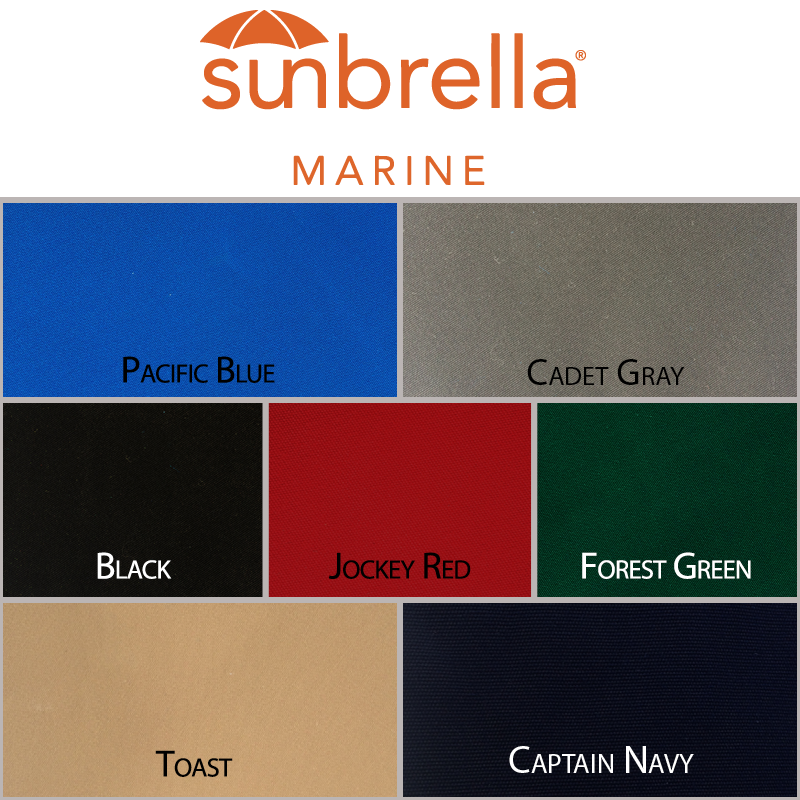 If you live in a very mildew prone area and the boat is rarely trailered or you remove the cover for trailering, Sunbrella can be the way to go. Sunbrella is a woven acrylic fabric, and it uses the UV resistance properties of acrylic to last such a long time in the sun (easily more than 10 years). Since most of the Sunbrella material is acrylic, there are of course dyes in the fabric and other finishing chemicals for stain resistance and waterproofness, but the fabric itself is all acrylic. The dye is put into the plastic before it is spun into a yarn and woven into a fabric so you’ll often see Sunbrella imitations (”faux-brella” we call it) generically labeled as “Solution-Dyed Acrylic”. There are two shortcomings with acrylic fabrics: chafe resistance and ultimate strength. Ultimate strength isn’t really an issue as Sunbrella isn’t used for sails or very-very large structures, but chafe will very quickly wear a hole in Sunbrella – which is why I wouldn’t recommend trailering with a Sunbrella cover. If you think of trailering a boat on the highway at 70 mph its just like a hurricane, the cover won’t last. Sunbrella covers seem to do very well in the long term being exposed to regular storms with storm strength winds – just not hurricane strength winds. 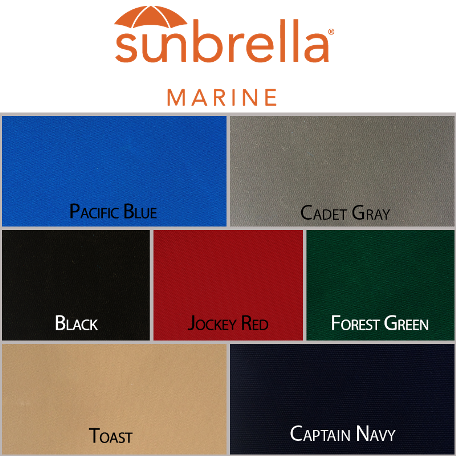 Over time the waterproof coating/finish on Sunbrella will begin to wear off after 3-4 years or so and you can purchase 303 Fabric Protectant brand spray to re-waterproof your cover. This is well worth the $15 bottle of spray and the fabric will work like new again, being both breathable and waterproof. Sunbrella covers are sewn in Tenara brand Teflon thread. This thread really does last forever, so you’ll never really have to get your cover restitched. If you trailer the boat at highway speeds for any distance you’ll have to have a Top Gun cover. 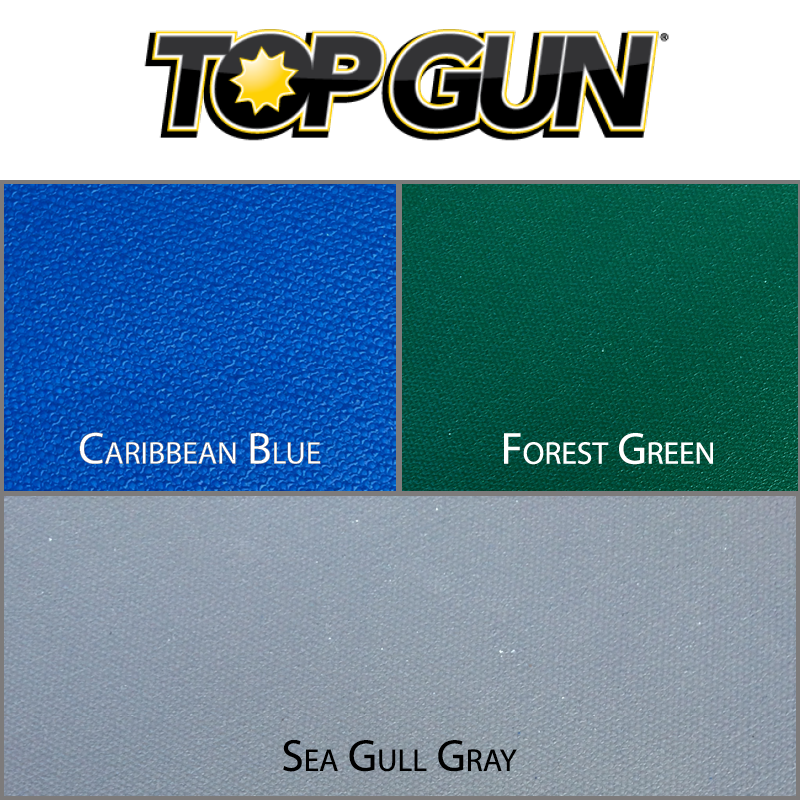 Top Gun covers will last for many thousands of miles of high-speed trailering wheras a Sunbrella cover may have holes in the first 20 miles… Top Gun uses a woven polyester (Dacron) base fabric which is somewhat similar to unfinished sailcloth – this is a very dense tough weave. 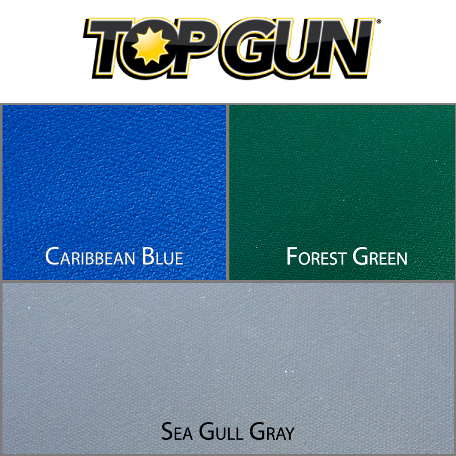 However, for the same reason you shouldn’t leave your sails in the sun, the polyester fabric really doesn’t do very well in the sun, so with Top Gun the fabric is heavily coated with… acrylic! 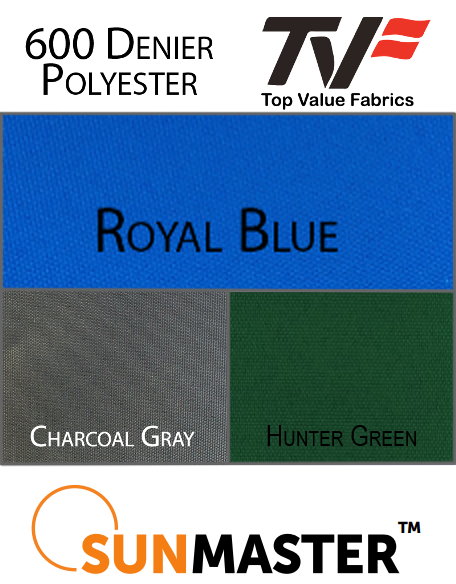 The polyester fabric provides the strength and toughness while the acrylic coating protects the UV fragile polyester from the sun. The only problem is breathablity. This cover is also sewn in Tenara brand Teflon thread, which has amazing UV resistance and will last nearly forever in the sun (which means no restitching the cover for you). 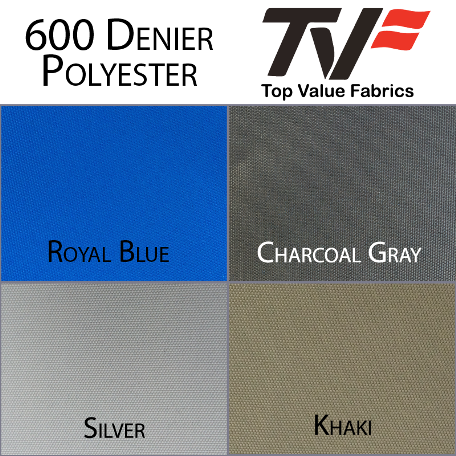 Although polyester covers do not have all of the advantages that the Top Gun and Sunbrella covers boast, they are extremely economical. If your boat is not exposed to extreme conditions, then polyester is probably your best bet. Polyester covers will protect your boat from the elements for a number of years (think 3-5 years). These covers should not be trailered or exposed to high UV areas for extended periods of time (closer to the equator), but as long as you treat them right, they will do a fantastic job. 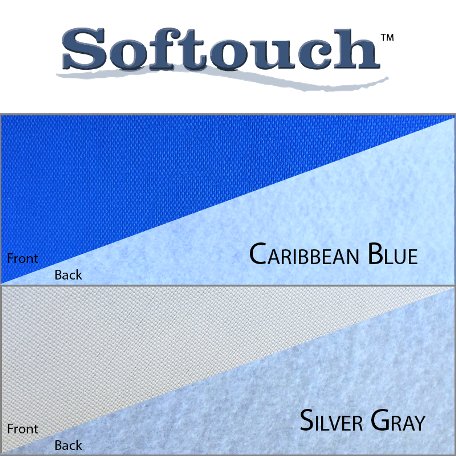 SofTouch is an ideal fabric for hull covers for those who want to protect the mirror finish of their hulls while trailering. This fabric is a laminated combination of Marlen's Odyssey fabric with a non-woven, almost felt like, underside. The underside has been designed to protect against scratching while the Odyssey fabric has high abrasion resistance and water repellency. The fabric features a three year warranty. The majority of our sail corner rings are Rutgerson rings from Sweden, though we do use some nickel plated brass spur grommets on low load corners of our dinghy sails. We own the entire size range of Rutgerson ring from the 10mm through the 55mm allowing us to select the appropriate ring for just about any size sail. The 10mm and 12mm rings are set by hand, but all of the others are hydraulically pressed with our 50-Ton press which is more than adequate for even the 55mm ring.